Come to Posman Books at busy Ponce City Market in #Atlanta for your signed copy of No. 1 bestseller #DiamondsFromTheDugout! Thanks to Yem and everyone for your hospitality at today’s book signing on our Southern States Tour! This is our 106th store signing in the USA and it is an honor to be at this historic building that once was a Sears & Roebucks warehouse in the 1800s, then abandoned and decayed, then a great American revival! Posman Books has been great to us from NYC to here and thanks for putting us by the heavy hitters! Ooh look I’m next to Omarosa! See all the pics from our 105th book signing at http://facebook.com/MarkNewmanAuthor. Historic #Spartanburg helped make our freedoms possible thanks to their role in the Revolutionary War. Great to spend a birthday here and sign #DiamondsFromTheDugout at Barnes and Noble here in South Carolina! Thanks to Luke and the team here. Get your signed copy next to Chipper Jones’ great book. The birthday ended perfectly, because a new friend named Mo, who had been working hard all day, got to take home a full birthday cake to his son (thanks, Ingles!) as well as a personalized copy of the No. 1 bestseller! 💎⚾️ See all the pics at http://facebook.com/MarkNewmanAuthor. We ❤️ @bnwinstonsalem! Thanks to Carmen and the amazing team at this Barnes and Noble in Winston-Salem, NC, for showing so much love to Bingley and #DiamondsFromTheDugout! Signed copies are at the main desk! DAWG! 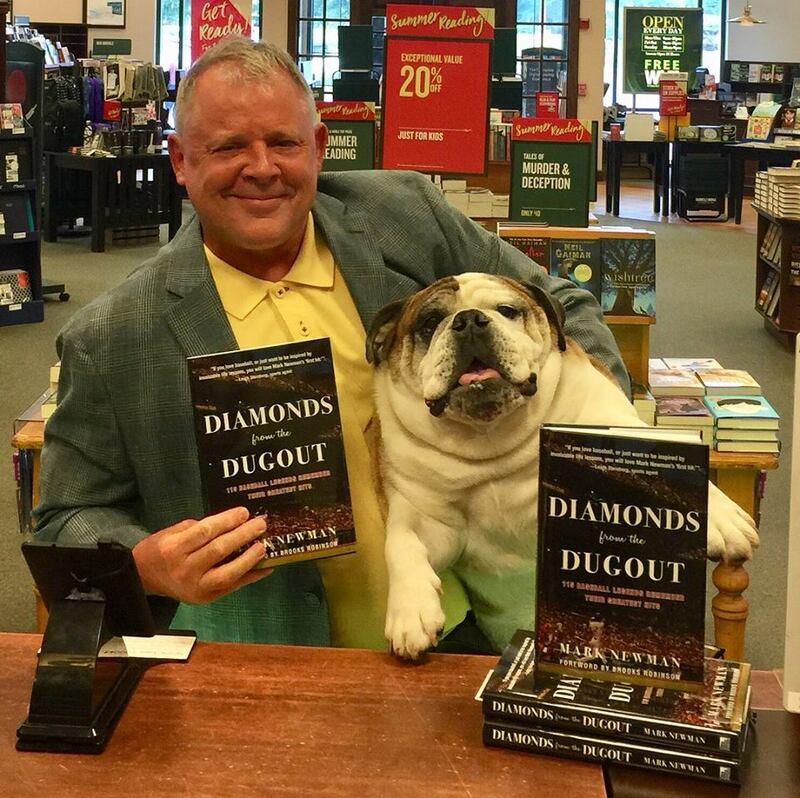 We celebrated the 100th store signing of #DiamondsFromTheDugout at Barnes & Noble in Athens, Georgia. That was my nod to Bingley, who has been such a cool traveling companion throughout the USA book tour this past year. He loved being around the home of the most famous english bulldog of them all, Uga. Thanks to Pat, Tyler and the team at this BN location. There's a cooler filled with Heinekens on ice in the back of the Jeep, and we emptied most of that and shared a 16-ounce Fort Worth ribeye back at the hotel afterward. Bingley loves this book tour. Grab a signed copy at this store! Thanks to Sydney, Andrea and the team at Barnes & Noble in Newnan, Georgia, where we kicked off the Southern States Tour for our 99th store signing of #DiamondsFromTheDugout! Get a signed copy here, at Newnan Crossings. This was a fun visit because Newnan is the home of Alan Jackson, so it was great to play his music while driving around town and looking for his boyhood "Home". Make sure you check out historic downtown Newnan, and the painted animals all over the main town square, benefiting the Children's Museum. Sadly, Chik Fil A was closed on Sunday. We want to hit the original store. Thanks to Mariana and the team at Barnes & Noble in Evansville, Indiana! 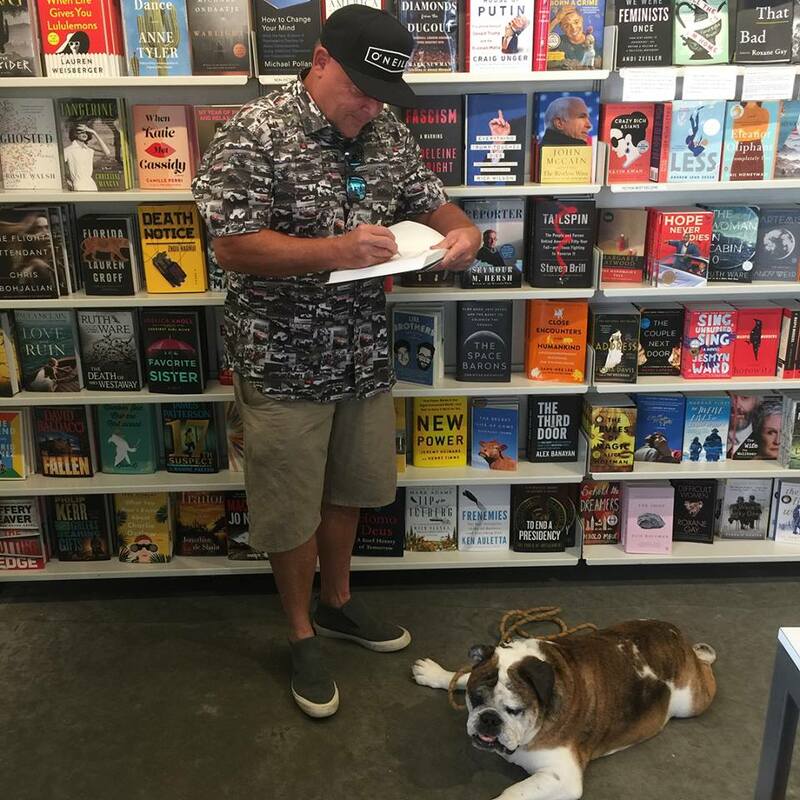 We returned on this day to the setting for the unforgettable #DiamondsFromTheDugout book launch last fall and signed many more books in the store cafe area. Signed copies are available now at this store on Green River Road in the author's hometown. Thanks to Barnes & Noble Colonie Center in Albany for my second store signing, and for the terrific end-cap display celebrating the arrival of new baseball books! Signed copies are available at this beautiful location. Thanks to Terry and the awesome team at Barnes & Noble St. Petersburg on Tyrone Boulevard for the final stop on the #DiamondsFromTheDugout Spring Training Tour! Signed copies are waiting there for Grapefruit League fans as the games go on. Thanks to Barnes & Noble Clearwater for the hospitality during this stop on the #DiamondsFromTheDugout #SpringTraining tour! This store is right by the #Phillies Grapefruit League ballpark, and fans can find signed copies there while the games go on. Barnes & Noble Sarasota, first stop of the day on Day 2 of the #DiamondsFromTheDugout 2018 Spring Training tour. Thanks to Dominique and the awesome team for your hospitality! Hopefully the man who came in and asked for "Moneyball" for his book club got the hint with the two DFTD signed copies sitting next to him on the Customer Services counter! Get a signed book here, watch the Orioles at nearby Ed Smith Stadium while you read Brooks Robinson's Foreword and Cal Ripken's story, and relax on No. 1 ranked Siesta Key Beach! 66th store signing: The largest bookstore in the world now has signed copies of #DiamondsFromTheDugout right inside the front door, next to books by Elin Hilderbrand and Al Gore. Thanks so much to the magnificent team at Barnes & Noble Union Square for our second signing there, following the sales through a busy holiday season. Yankees and Mets fans, come and get your copy of the No. 1 bestselling baseball book! Follow marknewmanauthor on Instagram to see the whole book tour. It was such an honor to enter the architecturally majestic Barnes & Noble Nashua in New Hampshire as the last stop on our #DiamondsFromTheDugout #BarnesandNobleStormingTour across New England. Red Sox fans, get your Diamonds! Follow marknewmanauthor on Instagram to see the whole book tour! Entering a new U.S. state for the first time in about 30 years, I was delighted to roll across the New Hampshire state line into Barnes & Noble Salem and then sign #DiamondsFromTheDugout copies while on the #BarnesandNobleStormingTour across New England. Red Sox fans, get your Diamonds! Follow marknewmanauthor on Instagram to see the whole book tour! 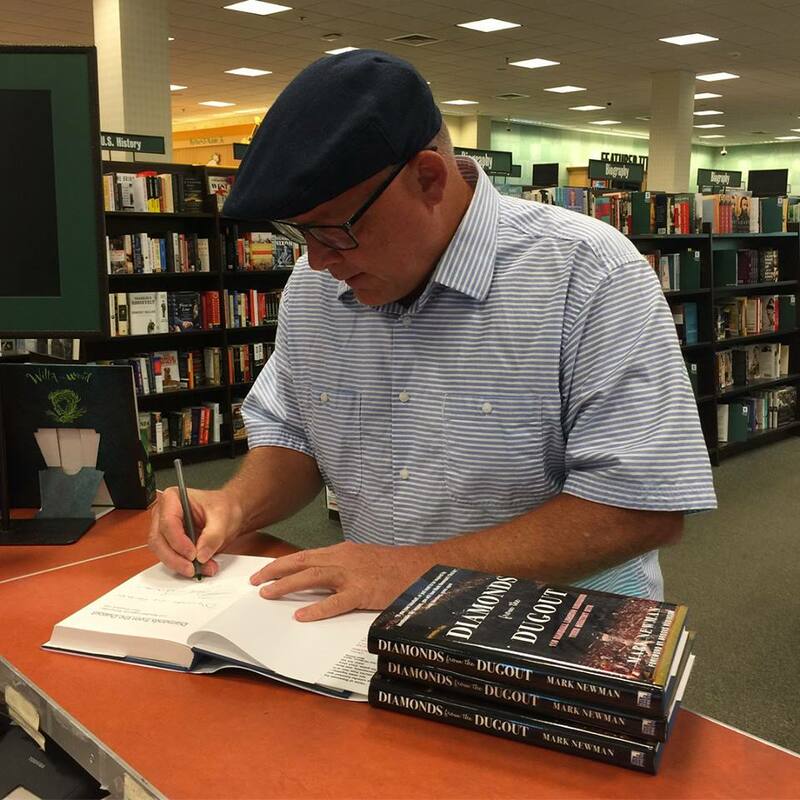 Barnes & Noble Prudential Center on Boylston is an iconic bookselling venue near the Boston Marathon finish line, and on Sunday morning I signed a batch of #DiamondsFromTheDugout copies while on the #BarnesandNobleStormingTour across New England. Thanks to the great team there for prominently placing the signed copies in the center of the store on a signed editions display! Red Sox fans, get your Diamonds! Follow marknewmanauthor on Instagram to see the whole book tour! Signed copies at Barnes & Noble Framingham in Massachusetts during the #DiamondsFromTheDugout #BarnesandNobleStormingTour weekend appearances throughout New England. Get your signed copy today and follow marknewmanauthor on Instagram to follow the tour. Signed copies at Barnes & Noble Smithfield in Rhode Island during the #DiamondsFromTheDugout #BarnesandNobleStormingTour weekend appearances throughout New England. Get your signed copy today and follow marknewmanauthor on Instagram to follow the tour. The #DiamondsFromTheDugout #BarnesandNobleStormingTour headed for New England, starting at Barnes & Noble Warwick in Rhode Island. Signed copies are available! Barnes & Noble Bay Shore was the fourth of five #DiamondsFromTheDugout signings as the #BarnesandNobleStormingTour spent all Saturday on Long Island.